The Goblinblood Wars that ravaged Isger more than a decade ago didn't just set fire to villages; it destroyed families. Among these was the wealthy Irrica family, all but one who perished during this tumultuous time. Now that Isger's government has begun declassifying reports, the Pathfinder Society has learned that the Irricas commanded some supernatural force that convinced even the mighty House Thrune to give them space. With these leads now public knowledge, the Society sends the PCs to piece together the broken family's history and recover this secret weapon before it falls into the wrong hands. 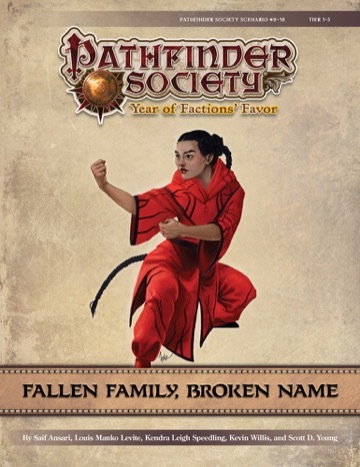 Fallen Family, Broken Name includes five 1-hour adventures that take the PCs across Isger to uncover the Goblinblood Wars' forgotten events and a family's tragic past. The series includes a beginning adventure and a finale, but players can experience the other parts in any order. Barring Unforseen acts of god . Roger Cherni & Dawn Cherni will be attending and would like a seat at the table. New question what is the food/drink policy for Recess? Can you bring in or have to buy at store or eat away from store been a number of years for me playing there. Because recess is our host we would prefer if you got drinks/snacks at recess. They do allow meals within reason. Just remember they let us use that space for free, so please support them as much as you can, without them we will not have a gaming space. When I get home I’ll fix the goof in the RSVPs. With three confirmed players we will have a legal table going off. Thanks for the information and we shall abide on snacks will let wife know, we may bring water in, two bottles but snacks and soda we will buy there.